Deadly Coal is the result of research from 2007 to 2009 by Indonesia's mining advocacy network, JATAM, and Friends of the Earth Indonesia(WALHI). It exposes the true costs of mining for the people of Kalimantan. Coal is the latest in a series commodities used by the Indonesian government to boost macroeconomic growth. This is the development model pursued for thirty years under the regime of former president Suharto and is still continuing today. Timber, oil & gas, gold, and now oil palm, migrant workers and coal, are exported to generate foreign exchange, at the expense of local people who must suffer the impacts. This development path - a systematic, planned exploitation of Indonesia, island by island - is littered with corruption scandals, human rights abuses and environmental damage. There is no attention to the true social and environmental costs, or to the impact on food and energy security. facilities and infrastructure for industrial services through the establishment of road networks, bridges, sea ports and airports to facilitate the smooth flow of raw materials to the market. legal certainty to facilitate more investment through policies to cut red tape and through financial incentives. If people living in targeted 'development' areas object, they are accused of being anti-development and criminalised if they refuse to hand over lands. The government keeps sending out the message that people's needs will be met through exporting commodities, while carrying on with the same "sell raw, sell cheap, sell all" strategy for the country's natural riches. The two provinces in Kalimantan currently most affected by the industry are East Kalimantan and South Kalimantan. In East Kalimantan, the timber industry has decimated the forests since the 1960s and is now in steep decline: plywood mills have stopped operating and workers have been laid off. Gold mining has also stopped in West Kutai district, where the UK-based mining company Rio Tinto has left 77 million tonnes of tailings. Coal is now the boom commodity: In the past six years the government has issued thirty-three contracts of work (PKP2B) to large-scale foreign and Indonesian coal mining companies and 1,212 mining permits (KP) to domestic companies. East Kalimantan's development plans have set aside 3.12 million hectares of land for KP mining concessions, more than the 2.49 million hectares allocated for agriculture. East Kalimantan has predicted coal reserves of 1.983 billion tonnes and coal has helped make it the largest provincial economy in Kalimantan. For the central government, the province is like an ATM machine - a ready source of cash. Yet locally, poverty is on the increase: the number of people living below the poverty line in March 2007 was around 324,800 or 11% of the total population of 2.9 million. This was an increase on the previous year of more than 10%. Unemployment is one factor: the three cities with the highest rates of unemployment are Samarinda, Balikpapan and Kutai Kertanegara. Yet between them, Samarinda and Kutai Kertanegara have the greatest number of mining concessions in Indonesia, a total of 781. It is clear that the mining industry is not helping to address unemployment, since the industry is capital- and technology-intensive rather than labour-intensive. East Kalimantan acts as major supplier of coal to both Indonesia and the world. It provides Indonesia with half of its domestic supply, while around 70% of the coal extracted from the province (around 120.5 million tonnes in 2008) is exported to other countries. Yet the local population does not benefit. The local power system is only able to supply 610 villages out of a total number of 1,410 villages (43.26%). Samarinda the provincial capital, with a population of just over half a million, suffers regular blackouts. East Kalimantan's coal, it seems, is only for entrepreneurs, corporate giants and the state. The three districts which have the lowest levels of electricity supply are East Kutai, West Kutai and Berau. Only around a third of the 475 villages in these three districts have electricity. At the same time, there are three giant mining companies operating in these areas, PT Kaltim Prima Coal (KPC), PT Indominco Mandiri and PT Perkasa Inakakerta. Together, these companies account for most of the coal produced in East Kalimantan, with total production reaching 48.4 million tonnes in 2008. The power injustice is most palpable in East Kutai district - the district where the KPC is located. Here only 37 out of 135 villages (50,175 households), have access to electricity. Almost half the population of East Kutai district are regarded as poor, with most living near the mine. The amount of electricity needed by the total of 50,175 households is 45 MW. To run its operations, KPC itself has access to enough electricity to supply 21,000 households (18.9MW). This is generated by the Tanjung Bara power plant, with a capacity of 10 MW and two reserve diesel power plants (PLTD) with a capacity of 8.9 MW. The power plant consumes 96 tonnes of coal every day, plus 120,000 litres of fresh water for the boilers and at least 302,400 litres of sea water as coolant. These processes produce 2.3 tonnes of waste fly ash and 1.5 tonnes of bottom ash per day. 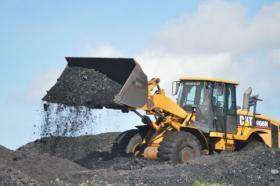 PT KPC plans to increase production to 70 million tonnes of coal by 2010. This will require increasing the supply of electricity to 152 MW - equivalent to three times the electricity needs of the residents of East Kutai. East Kalimantan's Kutai Kertanegara district is rife with coal rush corruption. Up to 2009, the district had issued 687 KP permits, with 247 permits issued in 2007-2008 alone (or one permit issued every two days). The district is known as the most corrupt in East Kalimantan Province. Eight senior district government officials have been jailed within the past six years on corruption charges. The corruption started from the top with the district head (Bupati), the deputy district head and included the chair and vice-chair of the district assembly. The district head for the 2005-2010 period is in jail for corruption of IDR124 billion (USD13million). In addition, 37 members of the local government (2004-2009 period) have been involved in the corruption of social welfare funds. These cases have accelerated changes in local government personnel: in the past four years there have been four different district heads in Kutai Kertanegara. An example of coal-linked abuse of citizens' rights is an incident on 20 August 2008. This involved violence by the East Kalimantan Regional Police Mobile Brigade and the Kutai Kertanegara District Police against local people who were demonstrating to demand the return of their land. The land had been allocated to PT Arkon in Semaleh Village, Bangun City District. The protesters were beaten, kicked, and even shot. One person was killed, four other people were injured and two have been maimed for life. Another 24 people were jailed with seven month sentences. The legal justification for this was that the protesters were carrying knives and creating unrest. In contrast, no trial has been held for the police officers involved in the shooting and killing. In West Kutai district, there are 87 KP mining permits and 3 PKP2B coal contracts of work spread over 20 districts. Just three companies mine 9.7 million tonnes a year. Prostitution is common near mining sites - sometimes as many as three brothels near each mine. In Melak District, for example, near the village of Muara Bunyut village, there are four brothels near PT Gunung Bayan Pratama Coal (an Indonesian company) and PT Trubaindo Coal Mining (a Thai company). Increasing numbers of people have sexually transmitted diseases. Other mining-related health impacts in this district include Acute Respiratory Tract Infections (ISPA). In 2007, West Kutai Public Health Service recorded 19,375 people with ISPA. This was an increase from 17,373 in the previous year. Records in 2008 showed that 2,233 of those with ISPA were babies and 5,701 were children. Since coal extraction has increased in the last four years, floods have now become routine in Samarinda, the provincial capital. This is widely linked to deforestation, making way for mining activities, and poor drainage in the area. From November 2008 until May 2009, there was widespread flooding in almost all the city's districts. In those six months there were four major floods. Each time, an area inhabited by around 10,200 families was flooded and almost all the main streets in Samarinda were affected. In response, people have started to raise the foundations of their houses or even build stilt houses. Many have sold their homes off cheaply. Floods also disrupt the local economy, including public transport and markets, affecting employment and earnings. While Samarinda is now called "flood city", income from the coal industry contributes very little to local revenues. In 2008, income from coal mining only amounted to IDR 399 million (USD37,000), a mere 4% of Samarinda's total regional revenue of IDR 112.5 billion. The cost of flood prevention alone is far greater than this. Flood prevention polders (large water storage reservoirs) cost at least IDR 38 billion each. The city has built one costing IDR 63 billion and is planning to build another five. In South Kalimantan, income generated from extractive industries dominates the province's GDP. Up to 2008, there were at least 280 companies holding KP permits in the forests covering over half a million hectares. More companies were in the process of applying for 97 KP permits and 14 PKP2B contracts of work, covering another 50,279 ha. As in East Kalimantan, local people's needs have been sacrificed to provide coal for export markets. South Kalimantan is the second largest coal producer in Indonesia, and yet almost every day parts of the province suffer power cuts. Provincial energy needs of 270MW remain modest compared to the amount of energy being exported from the province, but the state power company is 30 MW short of this amount and 21,000 people are waiting to get electricity. Instead of being used for local needs, over 73% of the coal mined in South Kalimantan is exported. The remainder is for domestic use - for energy and industry in Java, Sumatra, West Nusa Tenggara and Kalimantan itself. It is predicted that coal needs (from South Kalimantan) will increase sharply in future years, with the development of energy-hungry industries such as pulp and paper mills. The output of these new industries will also be exported. The gap between high and low incomes in South Kalimantan is getting wider and researchers have shown that mining has not been able to bring prosperity due to the low level of revenues combined with corruption. Again, coal does not offer much in terms of employment for local people. The current population of South Kalimantan is 3,250,100 (2008), with a labour force of 1,468,590 people, 45% of whom are actually employed. The agricultural sector absorbs almost 51% of the work force, while mining only employs 2%. Even then, most mine workers come from outside local villages or even from outside the province. River pollution affecting surrounding villages - local people are no longer able to use the river water for daily needs. One of PT Adaro's pits is one kilometre in diameter with a depth of 30-40 metres (PT Adaro has two pits). One pit is now a lake. Land disputes with local residents affect around 300 hectares. The process to set compensation, and the amount of it, have been unfair. Conflicts have also arisen within the communities due to conflicting claims over land caused by the chaotic land acquisition process. Two villages, Lamida Atas Village and Juai Village, were displaced by the expansion of the mine in 2003. The incidence of violence against residents and environmental activists has increased as the company pushes ahead with operations. Meanwhile it seems the security forces don't want to take any responsibility for this. In other districts of South Kalimantan a range of problems are evident. In Tanah Bumbu District, some mining is going on within a protected mountain forest. River barges have been used to transport coal since 1999 causing widespread contamination of the water with fuel oil. Previously, fisherfolk from Satui village fishing in the estuary could earn fifty thousand to two hundred thousand Rupiah a day. Now daily earnings have reduced to between thirty thousand and a hundred thousand. The Salajuan River is drying up, the water is turning black and it can't be used by residents for their daily needs. Local people suffer from coughs, shortness of breath and eye diseases. On Sebuku Island, Kotabaru District, the coal mining company PT Bahari Cakrawala Sebuku (BCS) has been allowed by the government to mine in the forest nature reserve. Since operations began in 1994, there have been water crises in two villages, the river has changed course and local people's rubber production has declined. Even the local cemetery and the speedboat service jetty were removed in 2003 in order to extract the coal underneath. Suspend all licences and licensing processes for any future investments and developments which have a dirty social and ecological footprint such as coal and mineral mining, large-scale oil palm businesses, the clearing of peat land, large-scale fisheries, oil exploitation and logging concessions in the remaining natural forests. People's ability to preserve, protect and restore the sustainability of ecological services. Work towards a new development paradigm and the long-term effort needed to achieve intergenerational justice.